My story ‘Flying Foxes’, a finalist in the Carmel Bird long story award, is to be published in 2015 as a digital story. Twelve stories, including award winner Marjorie Lewis-Jones, will be published from June this year as the series Michael McGirr Selects, by publisher Spineless Wonders — host of the Carmel Bird Award. Publisher, Bronwyn Mehan, said Spineless Wonders’ mission for the 2014 competition was to find the best Australian long stories between 4,000 and 10,000 words. The competition had drawn an unprecedented number of entries, she said, and Mr McGirr told her reading and judging the stories had been ‘a real pleasure’. Michael McGirr is a well-known Australian writer whose books include Things You Get For Free (Scribe), Bypass: The Story of a Road (Picador) and The Lost Art of Sleep (Picador). Carmel Bird is one of Australia’s leading authors of short stories with a new collection to be released by Spineless Wonders in August 2015. ‘Flying Foxes’ is the story of a relationship between two brothers, one suffering from schizophrenia. 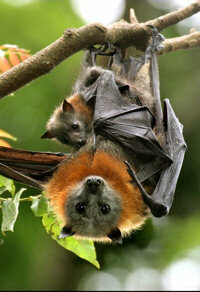 Flying foxes are a persistent presence in their lives. I will post details about how to purchase ‘flying foxes’ when available, later this year. I look forward to reading all 12 stories.